At this crew lunch, we decided to try and grill three native chickens over hot coals. We bought the native chickens at the market, where they often sell them still alive, and had them cleaned and de-feathered. Native chickens generally have tougher meat, but possess a more flavor than commercially raised chickens. Perhaps they are best showcased in soup or slow cooked stews, but we were curious to try them roasted. We just stuffed the cavities of the chickens with lemongrass from the garden, salt, pepper, lemon juice, a touch of hot pepper and slathered the outside of the birds with olive oil and a touch of soy sauce. Once they were cooked, visions of their flying through the jet engines of a 747 flashed through my mind, but the taste and flavor were excellent. These were not your supermarket rotisserie chickens. I’m sure your crew are always eagerly awaiting the next bday celeb or any occasion to celebrate. What a lucky bunch! 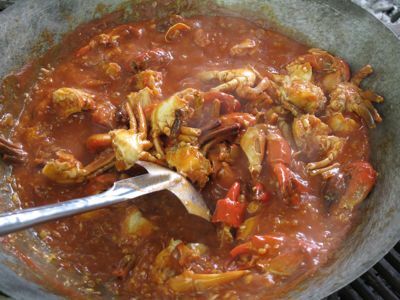 I’ve tried your chili crab recipe and it’s super delicious! Wow!! Wish I was part of your office crew!! 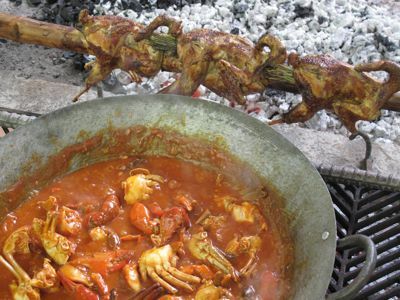 Yummy looking chili crabs…looks so delish…my fave…crabs!! Talk about office lunch! And all we have here are potlucks brought in cold in the morning and reheated in the microwave! Do you have an opening for a nurse? I am a good cook too! mm, i wanna apply in your company. I love the food feast for the crew. Hi MM, What a great lunch indeed!!!! You may want to deep fried a plain pao or may be a pandesal to dip into those lovely sauce of your chili crab. I’m sure your crew will enjoy it. 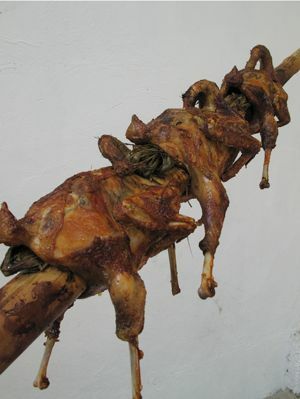 MM, there’s a bahay kubo style restaurant near SM Cebu that serves primarily roasted native chicken. I love native chicken’s taste and leanness. The skin is so thin it’s almost translucent. They have an outlet in Manila somewhere in Quezon Avenue. wow mr.mm, you make a simple meal a feast! At my job we used to do “Salad Days”, where everyone would bring in an item to toss into a salad. Then we’d set it up on a table, everyone would go around and take what they wanted in a salad. It was fun until the boss nixed it. i’m sure everyone in your office is a happy camper with power lunches like this! seeing that grill made me think of lechon sisig again! Yummy! Camaraderie among workmates is an important ingredient in success. What a flavorful way to develop it. Instead of the usual team-building activities, cooking together sounds good and tastes even better. Wow sarap! Makes me want to eat crabs for dinner. Hey, MM…ako rin…sali ako!! Do you have any job opening in your company, MM? Having lunch with your people is a very good way of communication. You get all sort of news and information that you don’t normally get when you are in your office itself. I wish more employers are like you. Where do I apply as the Information Technology director in your company. Thats a nice company lunch. Sarap. Fellowship through a hearty meal is the best way to celebrate big wins in the office. As what I normally tell my managers , which I picked up from my dad, ‘closest to the heart is the stomach’. Food is the best motivator. am in freezing france and am now hungry…pics look good enough to eat! am going out to get me some roast chicken before the boucherie runs out! Very good incentives to your employees and give them the feeling they are well appreciated. That’s a very good collective effort lunch! Ay ang sarap… I want to dig into to that large kawali of chili alimango… Yum. i miss eating alimango and all forms of shellfish after i was diagnosed with a thyroid problem. but the sauce of the chili alimango would do well with a steaming bowl of rice. and after reading the leche flan entries back-to-back-to-back, i want something savory now. i’m hungry! wow… was googling for “cold office lunch” and found this “Manila” post… But this just made me salivate and rue the day the building manager here declared microwaves a no-no. Your lunch cookout sounds like a fantastic opportunity not just to fill-up but also get to know each other and chill. Are you still having problems? ?